These are the most common questions from New CrowdSurfers. If you don't see your question addressed here, please feel free to email the CrowdSurf Support team at support@crowdsurfwork.com with your Work Market ID for more help. Why should I work with CrowdSurf on Work Market? How do I join CrowdSurf on Work Market? Work Market won't accept my location, what do I do? I have created my Work Market account, now what, where's the work? I lost my CrowdSurfWork/Work Market login information. Where can I find my Work Market ID? Where can I find the Job ID? When can I expect to be paid? My CrowdSurfWork Receipt Total says I have earned x, but my Work Market account only shows y? What are your standard base payments? What are your bonus rates? I think I was paid too much/too little, what should I do? How can I check feedback for my transcription work? Where are my "Edit the Transcription" tasks counted? Can I retake my CrowdSurf Transcription Assessment? I have issues with a transcript or review HIT, what can I do? What does my CrowdSurf qualification score mean and why does it go up and down? How do I score a perfect 4 on every transcription HIT? I'm working on CrowdSurf review Hits, what do I do? How do I continue to work on CrowdSurf HITs? How come there are so many CrowdSurf HITs at times and then so few HITs at other times? Why does Mturk show a different number of HITs than CrowdSurfWork? How do I find CrowdSurf HITs about specific subjects or that are high priority? How do I find the best paying CrowdSurf HITs? I am reviewing a clip with challenging audio and the worker used [INAUDIBLE] OR [UNKNOWN], but I can not understand the speaker? What does CrowdSurf do with my transcript? I want to learn more about "Freelance transcribing", who do I talk to? How do I learn about new CrowdSurf offers and bonuses on Work Market? I keep receiving empty HITs/I keep receiving HITs with foreign language, what do I do? My QC score for Review HITs is low, what's wrong? 1. Why should I work with CrowdSurf on Work Market? ANSWER: CrowdSurfers who work through Work Market earn 10% more than CrowdSurfers who work on Mechanical Turk. This means that if you're working in the "Transcribe up to 35 Seconds of Media to Text - Earn up to $0.17 per HIT!!" queue and you get a 35 second task, you'll earn $0.17 in Work Market, but only $0.153 in Mechanical Turk. Switch to Work Market to earn the maximum amount on all CrowdSurf tasks! Learn more and get a Work Market account HERE. 2. How do I join CrowdSurf on Work Market? ANSWER: Work Market is CrowdSurf's hiring and payment platform. All work will be performed on our private editing platform CrowdSurfWork, and paid through Work Market. It's easy to get started, just create a Work Market account via this link, take our assessment, then wait for your new login instructions. If you have previously worked with CrowdSurf on other platforms and you need additional qualifications, just email us with your Work Market ID after you have received your new CrowdSurfWork login instructions. Learn more about getting started on Work Market here and here. 3. Work Market won't accept my location, what do I do? ANSWER: If you start to type your country, then select it from the pop-up, that helps. If it doesn't like your street address, do it the same way. Start typing then pick it from the pop-up. Please contact Work Market support for more assistance with this issue. 4. I have created my Work Market account, now what, where's the work? ANSWER: If you have successfully set up your account and passed the CrowdSurf Transcription Assessment, just wait for us to create your account and send you login instructions. This can take 5-10 business days after you complete the Transcription Assessment. Work will be available only on the CrowdSurfWork platform, you must wait for your login instructions to begin working. 5. I lost my CrowdSurfWork/Work Market login information. ANSWER: You will receive an email with your CrowdSurfWork username, password, and CSW ID when your CrowdSurfWork account has been created. Please save this email and keep this information handy. Please note, we currently do not support password changes on the CrowdSurfWork site. If you need help with your Work Market login, username or password, please contact the Work Market support team. 6. Where can I find my Work Market ID? ANSWER: It’s on your dashboard on Work Market. Look for it under My Profile at https://www.workmarket.com/home . From the Home Page hover over your profile picture on the upper right corner until a drop down menu opens. Click on My Profile. On the My Profile page you will find a User ID under the Overview tab, this is your Work Market ID. 7. Where can I find the Job ID? ANSWER: The Job ID is available at the bottom of the Help Tab on every HIT. Please include the Job ID and your worker ID in messages to CrowdSurf Support. 8. When can I expect to be paid? ANSWER: With Work Market you will now receive one payment for each batch of tasks completed in CrowdSurfWork. The number of tasks in each batch, and the timing of payments depend on your level of activity. Each batch will be paid after approximately an hour of inactivity. This will allow for more reliable CrowdSurfWork payments to your Work Market account. If you work for 40 minutes and then do not work for at least an hour, you will receive a single payment for all of the work completed in your 40 minutes of activity. Alternatively, if you work for 4 hours, take a 30 minute break, and then work for 2 more hours before stopping for the day, all of your tasks from the 6 hours of activity will be paid in one payment, likely while you are sleeping. Batch payments are designed to reduce the number of "cancelled", "invalid", "voided" notifications that you receive on Work Market. "I work on the CS platform and get paid on the Workmarket platform. All my jobs have gone pending since the 17th of June. Below is a screen shot of my zero payments and zero receipt numbers. " If you suddenly stop receiving payments for approved tasks completed on the CrowdSurf Work Platform, please review your account settings immediately. Accounts that are set to private, WILL NOT receive payments, as this will block all CrowdSurf payments to your work market account. 9. What are batch payments? ANSWER: A batch payment is a single payment in Work Market for each batch of tasks completed in CrowdSurfWork. No more 1:1 payment to task ratio! The number of tasks in each batch, and the timing of payments depends on your level of activity. This will allow for more reliable CrowdSurfWork payments to your Work Market account. Anonymous worker works 9 Transcription Review Tasks in CrowdSurfWork, totaling to $0.85 as depicted in the CrowdSurfWork Transcription Review Dashboard. Anonymous Worker stops working for at least an hour and checks Work Market for payments received. A single payment of $0.85 comes through Work Market for the batch of 9 Transcription Review HITs worked on CrowdSurfWork. 10. My CrowdSurfWork Receipt Total says I have earned x, but my Work Market account only shows y? "Under Payment Summary on my dashboard it says the payment amount total is $8.30, but under the Receipt Amount is lists $180.62. I was under impression that the payment amount was not per HIT, but per so many words, like .10 per so many words, for example. When I checked the World Market, there is $8.30 in my account." ANSWER: CrowdSurf pays per task on short Transcription HITs, and per media minute on Full Length tasks like Full Text Review. Your Payment Summary tab on your Work History Dashboard shows how much you earn. The Payment Amount total accurately reflects your total earnings. 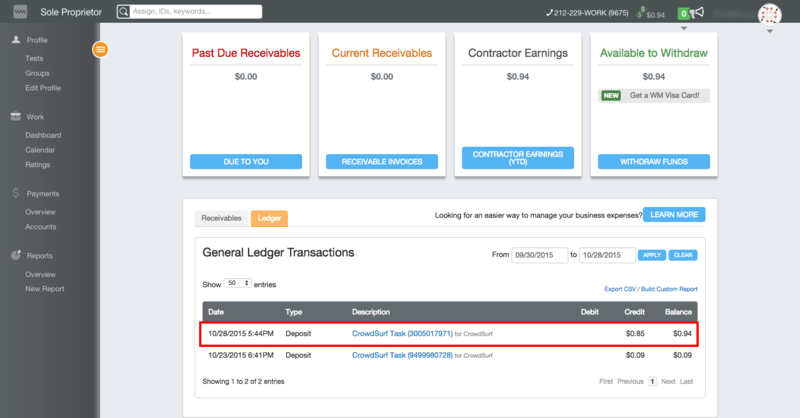 The Receipt Total total multiplies your batch payments and incorrectly inflates your earnings. Please use the Payment Amount column to verify or reconcile earnings collected on Work Market. 11. What are your standard base payments? ANSWER: Base rates for CrowdSurf HITs are subject to change. Base rates are determined on both the length and priority of the HIT. When you log in to your CrowdSurf account search for the 'High Priority' HITs with the higher payouts. 12. What are your bonus rates? ANSWER: *Bonuses change often. Updated CrowdSurf bonus information can be found on our website. 13. I think I was paid too much/too little, what should I do? ANSWER: Oops! Mistakes happen and if you feel like you have been paid incorrectly please contact us at support@crowdsurfwork.com. Please always include your Work Market ID in the email. 14. Can I retake my CrowdSurf qualification test? ANSWER: No, but you can email us at support@crowdsurfwork.com with your Work Market ID and we can set you up with new test material or assign qualifications to you. Please always include your Work Market ID in the email. 15. How can I check feedback for my transcription work? Feedback for your transcription work is available on your Work History Dashboard. Your Work History Dashboard can be accessed from the Stats tab of accepted tasks, or directly from the Dashboard tab if you are working on CrowdSurfWork. Learn more here about quality feedback. 16. Where are my "Edit the Transcription" tasks counted? "Edit the Transcription" tasks are recorded on the Transcription tab of your Work History Dashboard. As of May 2016, you can Cmd+F or Ctrl+F to search for "approved" on your dashboard to get an accurate total counts of "Edit" and regular Transcription tasks. "Edit" tasks are not currently included on your Stats tab count of Transcription HITs. Please use your Work History Dashboard to get an accurate count of Edit and Transcription tasks that count toward your weekly bonus. 17. I have issues with a transcription or a review HIT, what can I do? 18. What does my CrowdSurfWork qualification score mean and why does it go up and down? ANSWER: Generally the qualification score reflects the volume of work completed and approved but not necessarily the quality of your work. This score reflects when a HIT is approved (score increases by one point) and when a HIT is rejected (score decreases by one point) Scores will remain the same for HITs that were scored "poor". In order to continue working CrowdSurf HITs, the score must be above 900. At CrowdSurf we use our own measurement to maintain the quality of our transcripts. It's called the QC score (Quality Control Score). After you submit a transcript we have other workers that review those transcripts give it a score and make edits if necessary. These workers use a 1- 4 scale. A score of a 1 means fraud, transcript contained several errors like misspellings, punctuation, wrong words, etc that seriously affect the meaning of the transcript. A score of a 2 means poor, transcript contained several errors like misspellings, punctuation, wrong words but it was rather sloppy work than an intentional fraud. A score of a 3 means good, transcript contained some errors like misspellings, punctuation, wrong words that could have been transcribed correctly but it was mostly decent work and the majority of the transcript is correct. A score of 4 means perfect, the transcript perfectly matches the content of the video, the reviewer had to make minimal changes. On this scale, a HIT is being rejected if it receives a 1 or a 2 (your qualification score decreases on CrowdSurf), or is accepted if it receives a 3 or a 4 (your qualification score increases on CrowdSurf when you score a 4). We work to regulate both sides of this process, so we consistently contact workers with low scores, and we eliminate consistently harsh reviewers from our workforce to protect transcribers. You can access both your Qualification Score and your QC score on your CrowdSurfWork account. Find your QC score on your Work History Dashboard, and find your Qualification Score on your Qualification tab. Email support@crowdsurfwork.com with your Work Market ID if you have any question about this. (Please always include your Work Market in the email). 19. How do I score a perfect 4 on every transcription HIT? ANSWER: Our goal is verbatim transcripts with correct style and formatting. Use our style guidelines, and scoring criteria, and email us with questions. We are always happy to help! 20. I'm working on CrowdSurf review HITs, what do I do? ANSWER: Your job as a CrowdSurf reviewer is very important! You help decide the average score of workers when you award their transcript a Fraud, Poor, Good, or Perfect rating. Use the training guide to help you review transcripts. Our review process is completely automated, so just like any qualified worker can complete the transcription HITs on CrowdSurf, any qualified worker can complete the review HITs on CrowdSurf. Use our scoring criteria to make sure you are accurately and fairly reviewing each transcript. CrowdSurf will revoke review qualifications for any workers who are fraudulently or unfairly reviewing transcripts. 21. How do I continue to work on CrowdSurf HITs? ANSWER: To keep your CrowdSurf qualifications (visible in your Work History dashboard) you must maintain an average score of 3.5 or higher and an approval rating 95% or higher. We will revoke your qualifications if we feel that your quality/accuracy is too low or you are incorrectly reviewing transcripts. In most cases, we send you a warning first if your score falls below 3.5 or if our data shows that your reviews have been too harsh or too lenient. However, if we see that there is no improvement or if we see a very low score and a high number of completion we will revoke your qualifications without a warning. If you feel like this action was unjust you can contact support@crowdsurfwork.com. Please always include your Work Market ID in the email. and we can look into your case further to determine if we will give you your qualification back or not. 22. How come there are so many CrowdSurf HITs at times and so few HITs at other times? ANSWER: CrowdSurf provides an on-demand media captioning service. When our clients have a lot of media, we have lots of HITs available. Likewise, when our clients are creating new media, we’re slow to upload HITs. Please understand that we simply have inconsistent volume, sometimes more, sometimes less. We do our best to supply you with a steady stream of HITs, so keep checking CrowdSurf. To stay up to date with volumes feel free to check our website, follow us on Twitter or like us on Facebook. 23. How do I find CrowdSurf HITs about specific subjects or that are high priority? ANSWER: All of our media content is mixed among all of the different queues in CrowdSurf, so there's really no way to predict where lectures, sports, news, or cartoons will end up. We also cannot predict when we will have urgent HITs. It depends on our customers and it also depends on total volume in the system. 24. Why does Mturk show a different number of HITs than CrowdSurfWork? We recommend that you use CrowdSurfWork for the best experience with CrowdSurf HITs. Mturk and CrowdSurfWork pull tasks from the same system. Mturk has a display error that displays HITs that are no longer available, thereby inflating the number of tasks. CrowdSurfWork will show you available tasks only. 25. How do I find the best paying CrowdSurf HITs? ANSWER: Previously, you were paid the same reward for a 16 second HIT as you were for a 25 second HIT. Now, we've made the reward amount variable so you can earn more for the tasks that take more time to complete. The total reward for the HIT is viewable once you preview the HIT - so don’t be deterred by the base price! 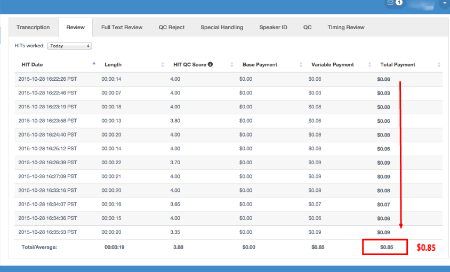 Each task type indicates the highest variable price available in the description. To see details and examples, click here! You can see this under your Dashboard. The variable payment for the longer HIT is higher than for the shorter HIT. 26. I am reviewing a clip with challenging audio and the worker used [INAUDIBLE] OR [UNKNOWN], but I can not understand the speaker? ANSWER: Please make a judgement call. If you feel like it was easily audible or the transcriber could have easily looked up the word in a search engine, then you should grade a 2=poor. If it was difficult to understand and it took you several times yourself to understand what was being said please grade a 3= good. When in doubt please score a 3=good. Please also consider that if the content is very specific, e.g. a higher education chemistry class, etc., and you are a chemist, that the word may be easy for you to understand and very difficult for others that have only basic or no knowledge of the field. 27. What does CrowdSurf do with my transcript? ANSWER: After you complete one of our HITs, your transcript gets edited by other workers just like you. Our transcripts go through a first pass in CrowdSurfWork with transcribers and reviewers, and then snippets are reassembled to form a complete transcript before going through a second pass for final editing. Depending on the client’s needs we will perform special handling, speaker identification, or quality control on your transcript. Once complete, your micro-transcript forms part of educational lectures, cartoons, sports broadcasts, news segments and much more! 28. I want to learn more about "Freelance Transcribing", who do I talk to? ANSWER: In addition to the CrowdSurf style guidelines and scoring criteria, there are lots of helpful resources available for you on the web. 29. How do I learn about new CrowdSurf offers and bonuses on Work Market? ANSWER: We will post daily messages for transcribers directly within the HIT itself on the right side of the media player for your convenience! Check for guideline updates and other important info straight from within the HIT you are working on. You can also navigate the tabs on the right of the media player for helpful hints and job-specific notes. Or check out our Website for updates! 30. I keep receiving empty HITs/I keep receiving HITs with foreign language, what do I do? 31. My QC score for Review HITs is low, what's wrong? I am new to review HITs and I am disappointed that I have a series of ratings of mostly 3s with one 2 and one 4, for an average of 3. On the review HITs, I can't click on the number to see the feedback like I can on transcription HITs. I can't improve if I don't know what I'm doing wrong. What can I do about to improve these QC scores. ANSWER: The HIT QC Scores that you see on your Work History Dashboard are the scores that you award those HITs based on the edits made and errors marked. We will contact you if we received a dispute about your HIT scoring. If we receive more than 3-5 valid disputes for your reviews in 1 week, you will be blocked from Reviews until you can complete further training. 32. How do I get promoted? ANSWER: High volume and great quality scores will get you there! We consistently invite qualified workers to join CrowdSurfWork platform based on their volume and quality of work. When promotion periods are active, we will look into our high volume workers work history. If you qualify for the next level promotion, our team will contact you with all the details. Still don't see your question? Suggest a new FAQ in an email to support@crowdsurfwork.com. Please include your Work Market ID in ever message to CrowdSurf Support. I have entered the info to get started. What do I do from here? I never received an email from your company. How do I earn qualifications for other tasks?